Gloveworks Heavy Duty Orange Nitrile gloves feature a true raised diamond texture for incredible grip. 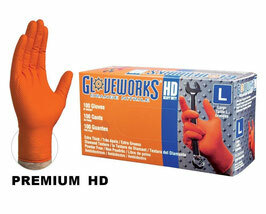 The bold, high visibility orange color really stands out and enhances safety. This glove features excellent chemical resistance from common chemicals, like pesticides and many other specialty chemicals, such as iodine, brake fluid or butane. Available in three sizes. 100 gloves per box. 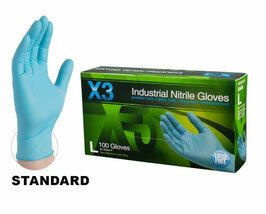 Economical and strong, these blue nitrile gloves are the perfect fit for almost any application. FDA approved for food service. 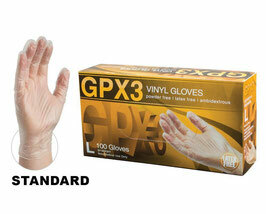 These gloves provide excellent protection and are LATEX FREE, so those with latex allergies need not worry. Available in a variety of sizes. 100 gloves per box. The GPX3 Vinyl is an industrial grade disposable glove is commonly used for food service, painting, janitorial, or industrial applications. FDA approved for food service. The PVC vinyl material provides excellent tactile sensitivity and are LATEX FREE, so those with latex allergies need not worry. The inside of the gloves features a smooth polymer coating for easy glove changes. Available in a variety of sizes. 100 gloves per box. 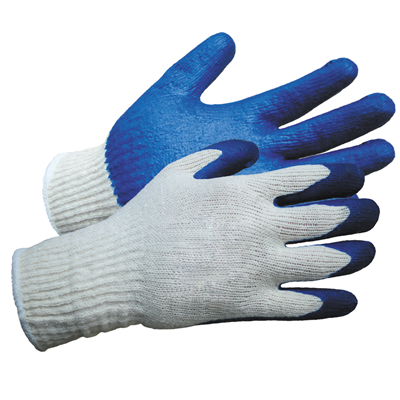 The unique textured latex coated palm and finger tips provide a secure nonslip grip that is hard to obtain by bare hands or by other cotton canvas, jersey, or leather gloves. Wonder Gloves help protect hands against minor cuts and abrasions yet work like second skin. Sold per pair.